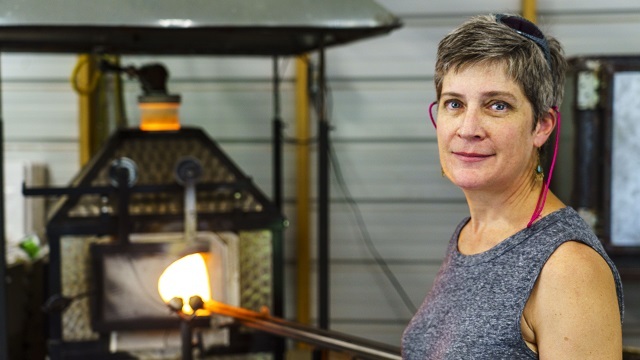 The temperature inside a glass-blowing furnace can reach more than 2,000 degrees, but after years of experience, Heather Hepp is used to the heat. Joined by her fiancée, Crichton Minges, Hepp runs Little Sandy Glass from a tree-shaded studio near Tuscaloosa. There the duo creates blown-glass artwork they exhibit on their Facebook page and sell at art shows and markets, such as the Tuscaloosa River Market and Market at Pepper Place in Birmingham. A New York native, Hepp discovered the colorful craft in Idaho, training and then teaching at the Boise Art Glass studio. In Boise, she learned how to heat, bend, weld and wind fragile materials into works of art. Heather Hepp of Little Sandy Glass is an Alabama Maker fashioning furnace-fired art from Alabama NewsCenter on Vimeo. Together, the couple craft a cornucopia of items ranging from crimson red pumpkins and heart-shaped paperweights to multisphere chandeliers. “When we moved, I wasn’t sure what would sell here,” Hepp says. “But last year our pumpkins did very well — you never can assume what people will like. And luckily for them, Hepp’s not afraid to take the heat. The Product: Blown-glass artwork ranging from olive oil bottles to decorative orbs, pumpkins and marbles.